The USA-EAST Sanctioned “Run What Ya Brung” Modified 4×4 Truck class is a very competitive class of open class trucks. The rules make the class significantly more open in its complexion. Beginning in 2013 the class was opened to gas and alcohol trucks with superchargers (‘blowers’) that added some very strong trucks to the mix. And the rules allowed the use of Nitrous Oxide (NOS) in certain configurations. These changes were designed to allow the gas trucks and the diesel trucks to compete in the same class. And in 2017 two-wheel drive trucks were admitted to the class. Kelly Giltinan from Pittsfield, Pennsylvania is the RWYB class champion for 2018. Kelly competes with a very unique 1955 Ford named “BullHeaded” that has a Brian Knox Hemi for power. The engine has a 14.71 Super Charger (blower) that produces around 2000 horsepower in the 7500lb. pulling truck. Kelly won the first event of 2018 at Mercer Raceway Park and never looked back holding on to the point lead throughout the course of the season. 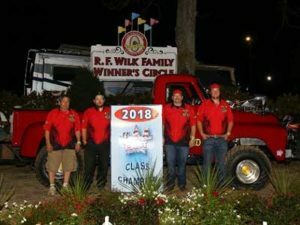 Diesel Trucks taking on Gasoline Trucks including both 2 and 4 wheel drive trucks in a 300-foot ‘free-for-all’ – that is the essence of the RWYB Modified Truck division, promoted exclusively by Full Pull Productions, Inc. and sanctioned by USA-EAST Sled Pulling. Cen.Pe.Co. Lubricants provided end-of-season bonus bucks to the ‘Run What Ya Brung’ division in 2018. The Central Petroleum Company of Cleveland, Ohio, and Wolcott, Iowa has been a consistent supporter of this class since it began.